Manufacturer of a wide range of products which include magnetic traps. Applicable industries Food and beverage, machining, pharmaceutical, chemical, ceramics, pulp and paper, etc. Our range of Magnetic Traps separators is tailor made for liquid/slurry materials and are meant for heavy duty bulky liquid line flow structures. The position of the magnet tubes is in such a manner that the captured tramp metal particles travel to the back of the tubes where these stay protected from wash off till the tubes are cleaned. The magnet cage is equipped with positioning lungs that assist with locating recesses in the body of the T-Trap avoiding rotation as liquid flows through the trap. With top access bolt on steel plate and seal, the T-Trap is simple to clean. 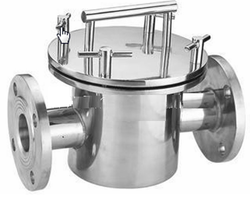 Magnetic Trap is designed in such a manner that it can be easily wiped and installed. These are available in 7 standard line sizes which vary from 1 to 18 inches in diameter. Looking for Magnetic Traps ?